I think I've mentioned about a million times, my deep love for anything and everything apple pie! Next to strawberry shortcake, it's my favorite dessert. So last week I had a light bulb moment...I decided to make apple pie ice cream. It started when my cousin Tabatha sent me a recipe for apple cider syrup, and my brains creative juices took over. With a few alterations I made the syrup recipe into a caramel apple sauce. I then took my tried and true vanilla ice cream recipe and turned it into a vanilla caramel ice cream base. I put the two together and it was apple pie goodness, all frozen into one delicious bowl of heaven! This recipe does take a little time, but if you're an apple pie lover like me...it's sooo worth it! Last time I posted an ice cream recipe, I received several emails asking me for a recommendation on an ice cream maker. I have to say my cheep, plastic, ice and rock salt machine produces the absolute best ice cream ever! A few years ago, I got a fancier one as a birthday gift. I tried it and then returned it. I went back to my old school model. You can find one similar to mine HERE! I have to say, I'm completely shocked though. When I did a search to find ice cream makers like mine, I couldn't believe how much they cost. I paid $14.99 for mine at Target 15 years ago. I guess inflation has really...inflated. 1. Combine the sugar, flour, cinnamon and nutmeg in a large saucepan. 2. Stir in the cider, lemon juice and apples. Cook over med heat, stirring constantly, until mixture thickens and boils. 3. Boil for about 6 minutes and remove from heat. Stir in butter. 1. Combine the sugar, salt and milk in a large sauce pan. Cook over medium heat, stirring occasionally until the mixture almost boils. Reduce heat to low. 3. Then take the egg mixture and slowly drizzle it into the rest of the hot milk mixture, whisking vigorously as you pour. 4. Continue to cook the milk and eggs over low heat, stirring constantly until it slightly thickens, about 2-3 minutes. 6. After 1 hour combine the chilled mixture, the whipping cream, vanilla and the caramel apple sauce. Whisk until everything is well incorporated. 7. Pour into the ice cream maker and follow manufactures instructions. 8. When the ice cream comes out of the ice cream maker, transfer to a large plastic storage container. 9. Pour the caramel ice cream topping on the top. 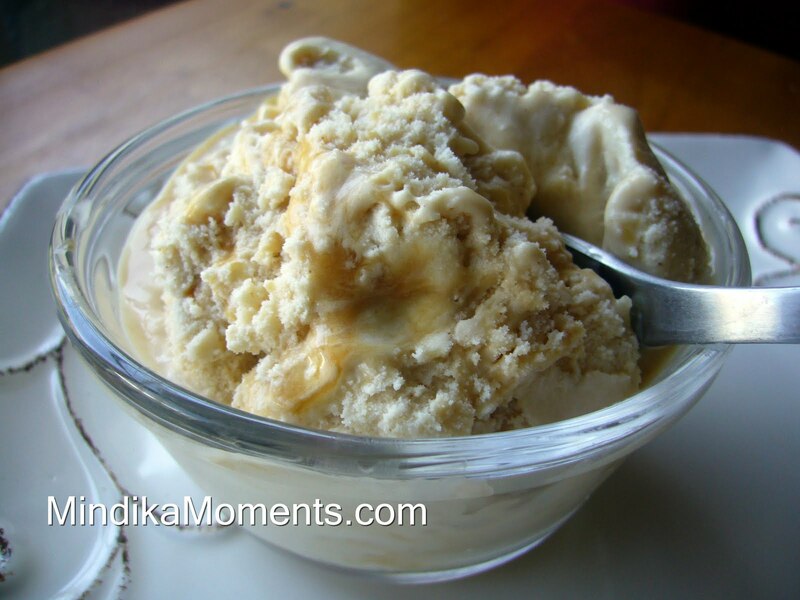 Take a knife or spoon and swirl the caramel throughout the soft ice cream. Be sure to just swirl and not mix it in completely. 10. Allow the ice cream to set up in the freezer for about 4 hours or overnight. 11. This recipe make about 2 – 2 ¼ Quarts of ice cream. As your brother I would like to be invited over next time you make ice cream. I'm just saying. are you kidding me with this? who needs chocolate now? I'm actually going to try it this summer. It's one of you many recipes I'm saving.